The NYC Acoustics N10AR is one of the coolest speakers on the market. It really gets the party going. This speaker, first and foremost, was manufactured to give you crystal clear sound. With 400 watts peak power this speaker is a power-house! with a built-in rechargeable battery this speaker can be used for lots of different applications. You can charge it and take it outdoors and use it for speeches, parties, tailgating, DJ events, and much more! If you play this at full volume at a house party, you will likely get complaints from the neighbors. The speaker is very loud. It is also perfect for small gigs. Please note we are aware of some brands on the market who write 2,000 or 3,000 watts on their speakers and they do not even go half as loud as these. There is no regulation on labeling watts on speakers. We are honest about our power ratings. We are honest about our power ratings. Before I talk about the features and options of this item, I wanted to talk about the guts of the unit. It all starts with the cabinet. One thing some audio enthusiasts overlook is the level of importance the enclosure of the speaker has on sound quality. This uses a top of the line wooden enclosure which is one of the reasons the sound quality is so crisp. Other brands use particle board wood which is not as dense as the high quality MDF wood we use. This item has a 10” woofer with 1.5” KSV voice coil and 25 Oz magnet that provides really CLEAN sounding bass. The 2 tweeters provide great sounding highs. One of the reasons our speaker sounds so good is due to the amplifier. Our engineers spent extra time and money on the built-in amplifier and properly matched the power handling. A speaker can only go as loud as the amplifier powering it. NYC Acoustics N10AR 10" 2-Way 60 Watt Rechargeable Active Speaker with Built In Bluetooth, MP3 display, USB, SD. 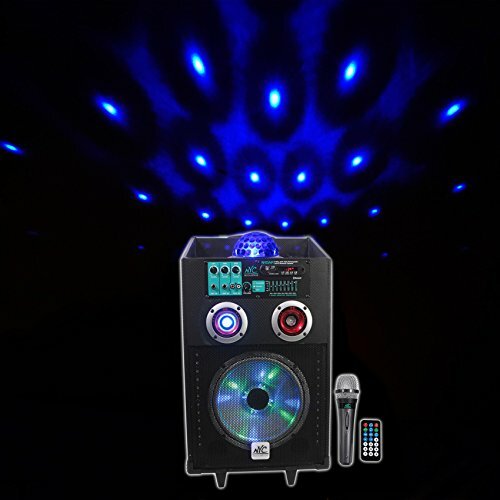 Perfect for house party’s, home use, Light DJ setups, tailgating, camping, and many other applications. 400 Watts Peak. High power long-throw 10'' woofer with 1.5" KSV voice coil. 10" Powered Bluetooth Speaker With 12V 5 AH rechargeable battery. Rechargeable battery lasts for 5-6 hours of low volume, 4-5 hours on medium volume, and 3-4 hours on extreme volume playback. Also includes remote, power cable, wired microphone , 10 Foot Mic Cable. Built In Wireless Bluetooth Supports Music Streaming Through a Bluetooth Phone or MP3 Player. 49 foot Bluetooth range. USB/SD digital MP3 music player. Built in FM radio. 1/4" mic input with level control. 1/4" line input with level control. RCA Aux Input with level control. Master volume control. Built-in wheels and retractable trolley handle for increased portability and transport convenience Provides incredibly deep bass and acoustic power. 5 band graphic equalizer built in. Magic ball on top transmits a disco dance light effect in the room. LED flashing lights on woofer. LED screen displays audio information when using Bluetooth or SD/USB player. Linear Class AB amplifier technology: high power, transparent sonic performance. Internal switch-mode power supply for low distortion audio with superior transient response. Boosting and cutting specific frequencies to improve sound quality and clarity. Frequency Response : 40Hz-20KHz. Maximum SPL @1w/1m : 105dB peak / 100dB continuous. High-quality components and exceptionally rugged high impact wooden construction. Amplifier clip limit LED indicator & power LED cabinet rear. 110/220 switchable Volt power supply with external user serviceable fusing. Speaker dimensions in inches : WxDxH 11.82" x 9.84" x 25.72". Packaged dimensions in inches : WxDxH 13.40" x 12.20" x28.79". Net weight : 27.52lbs. If you have any questions about this product by NYC Acoustics, contact us by completing and submitting the form below. If you are looking for a specif part number, please include it with your message.